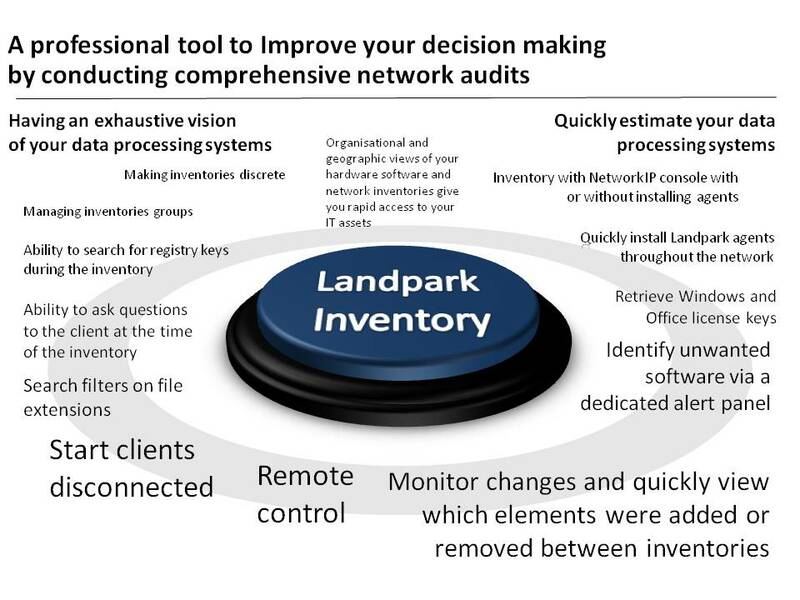 Landpark Inventory, Solution for your IT asset tracking needs to gain visibility and control of your IT assets. Landpark Inventory, user-friendly and easy to deploy, automatically collects all PCs, software configurations and allows you to realize substantial savings. Our expertise has been recognized by thousands of companies. Landpark NetworkIP: to inventory all your PCs and Servers. 1/ a Server module installed on any station through your network. Either as an application, or as a service. 3/ an Administration Consol module which makes it possible to parameterize and control inventories. Landpark IDA is a program that imports and updates automatically your inventory into Landpark Manager. It automatically checks all day at a specific time and setting, the presence of new inventory results files (DTA) in your results folder. Your inventory data in the database Landpark Manager are then brought up to date. Landpark Snmp: to scan your network elements. Discover rapidly your network and get a real‐time view of what's happening with your critical SNMP‐enabled network devices.